The Leader of Iran’s Islamic Revolution Ayatollah Seyyed Ali Khamenei says foreign powers, including the United States, are unlikely to wage a war against Iran. Based on political calculations, there is no possibility for a military conflict against Iran, but the country’s armed forces must still work to enhance their defence capabilities, Ayatollah Khamenei noted. “Although wars are not possible, Armed Forces must be vigilant and with effective management boost their human and equipment capabilities …,” the Leader said in a Sunday meeting with commanders of the Iranian Army’s Air Defence Base. The Leader, who was speaking on the occasion of the National Air Defence Day, described the army’s air defence base as a highly sensitive part of the armed forces which is on the front line of the battle against enemies. 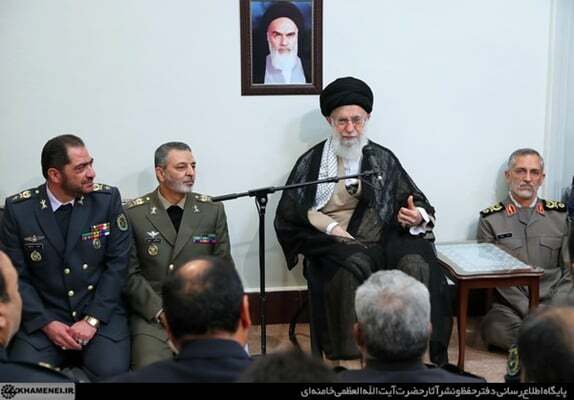 Ayatollah Khamenei stressed the need for improving preparedness and capabilities of the air defence forces. The Leader’s comments come as the US has in recent months been hardening its line on Iran, drawing out of the nuclear deal and reimposing anti-Iran sanctions suspended under the accord. The US is also working to hamper Iran’s trade with Asia and Europe and cut down to zero Iran’s export of oil. Tehran has threatened it would move to block the region’s oil flow in case its oil trade is stopped. US officials have announced they will prevent Iran from blocking the Hormuz Strait, a narrow waterway in the Persian Gulf that handles about one-third of the world’s oil traffic.